Idflieg solved this problem simply: soon Albatros Flugzeugwerke, which stopped at this moment production of obsolete Albatros D.Va type, received order on license production of D.VII on its plants. Apart from main factory, based in Johanisthal, Albatros had a branch factory OAW (Ostdeutschen Albatros Werken) on the Schneidemuhl, and these two plants could build many more aircrafts than on the Fokker plants. About 2600 aircrafts were built under license (together with OAW plant), - more than half from all built Fokker D.VII. The Allies received as trophies many D.VII just after the end of WWI; all other aircraft were scrapped in accordance with Armistice conditions. Roden definitely knows how to get the most out of its molds. The Fokker D.VII is a prime example of this. The D.VII was built by several different companies during its rather short production life. When you add that to the variations between early and late airframes, you have several different boxings. This brings about two things. One is that there are a lot of rather small parts as bits of the airframe are molded separately to take care of the differences. The other is that the modeler is given the most accurate representation of that variant possible rather than to have to make alterations to an existing airframe to incorporate the changes. This particular version is for those early D.VIIs produced by Albatross. Now you are probably looking at the image of the parts and wondering just what is different from the previous boxings. Roden has incorporated multiple bits on the standard sprues and as you can see, there are two engines, two exhaust, three props, three wheels, three gear spreader bars in those sprues. 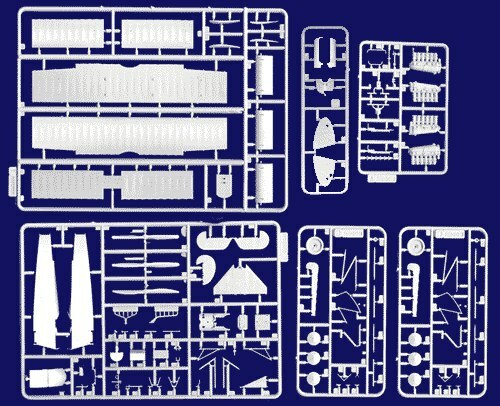 What is different amongst the kits is the top center sprue that has the forward engine panels and radiator. This is what allows the builder to do the variant that is boxed. Fokker D.VII (Alb) early, w/n unknown, Ltn. R.F. Jakobs, Jasta 43, mid 1918. Fokker D.VII (Alb) early, w/n unknown, flown by Ltn. August Hartmann, Jasta 30, July 1918. Fokker D.VII (Alb) early, Jasta 43, pilot unknown, July 1918. Fokker D.VII (Alb) early, w/n unknown, Ltn. Carl Degelow, Jasta 40, CO, mid 1918. The decals are well printed and I've heard that they have improved over the last year, which would be great as my previous experience with them was less than positive. 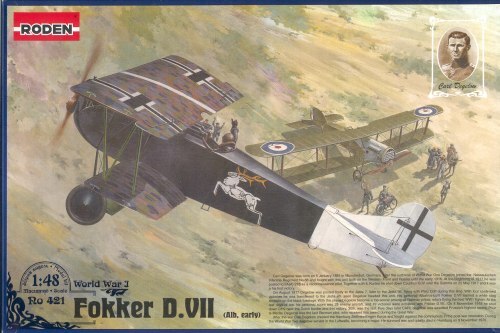 Once more a most welcome addition to the Fokker D.VII ranks and a kit that I'm sure will sell well. This is especially true as the retail price seems to have dropped several dollars, something that will make it even more desirable and an excellent return for the money. If you are used to modern multi-variant kits and want to try your hand at a WWI aircraft, this one would be a good choice.